I have tried to access the beta mobile app but get a login failure message each time. I know the email and password is correct. I think the subdomain is correct i.e. same as url without .com. Your subdomain would be just the first part of the address...so don't include ".cashboardapp.com" - just the part before that. Can someone give me an idea of how to login to the mobile app please. This would be such a good addition to the webapp, why is this not properly addressed yet? why is this not properly addressed yet? 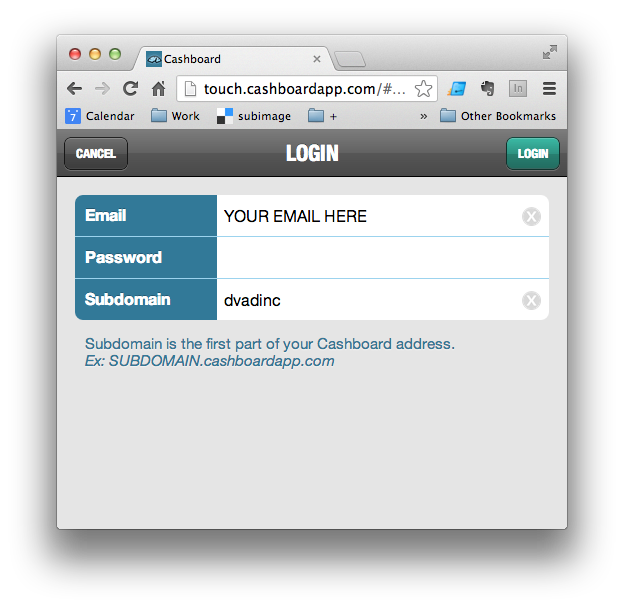 To login, you need your email address, password, and Cashboard subdomain - which again, is the part of your Cashboard web address without the "cashboardapp.com" part. For instance, if Cashboard address is https://webmonkey.cashboardapp.com - my subdomain would be "webmonkey". My apologies if I came over as being critical. It’s more being disappointed. I looked on both the google web app store for my Samsung phone as well as on an iPhone and the app’s does not seem to exist. Then, I also tried both the addresses you noted below and without any luck. My company name is dvadinc, so I replaced webmonkey with that but it just say ‘server error’. So, with this, there is two things. If the apps exists, they are way too difficult to find. The information contained in this e-mail message is confidential and subject to certain laws pertaining to the protection of proprietary information. It is intended only for the use of the individual or entity named in the address line above. If the reader of this message is not the intended recipient, or the authorized agent thereof, the reader is hereby notified that retention or any dissemination, distribution or copying of this transmission is strictly prohibited. If you have received this communication in error, please notify us immediately by telephone and delete all copies of the original message. Thank you. Derek, I see where the confusion is coming into play here. Our app is not one that you download. It should look like the image I've attached - but you can even go there in your web browser on the computer to see what it should look like. What you're looking for is called a "native app", from an app store. We hope to offer our app as one of these in the future, but for now you'll need to access it through your web browser on the phone. This allows us to develop one app for multiple phones. Hope that clears things up finally.